Austin Awad did not have a single offer from a four year school following his senior year of high school. On Saturday, he accepted a scholarship to play for Pat Kelsey and the Winthrop Eagles. The 6'6" JUCO wing's journey to becoming a D1 recruit was an uncommon one. At Melbourne HS in Florida, he found success on the court, culminating in All-7A class third team honors his senior year for the Bulldogs. Yet, while other all-class players were recruited by four year schools, Awad was not as fortunate. 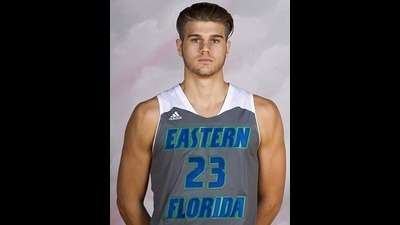 Though he was one of the top players on a 28-3 squad that made the final four in the state playoffs, the only offer he had was from Eastern Florida State College, a JUCO in his hometown of Melbourne. Instead of accepting the offer, he walked away from the game. "I thought I was done playing basketball," said Awad. Following his graduation from Melbourne HS in 2014, he spent a year away from the hardwood. He attended Tallahassee Community College as a regular student. After his freshman year at TCC, Awad decided he wanted to play basketball again. He reached out to Jeremy Shulman, head coach of EFSC, in hopes of walking-on to the team. "He approached us about coming back to basketball and walking on," recalled Shulman, who gave him a walk-on spot. Not only did Awad do well in his summer courses, he also excelled in practice. His hard work both on and off the court did not go unnoticed. Towards the end of summer, following a practice and in front of his teammates, Shulman awarded Awad with a scholarship. Awad served as the 6th man for the Titans last season. He averaged 7.4ppg (37.7% from three) and 5.2 rebounds a game, including a three game stretch of 20+ points a game in mid-Februrary. His efforts earned him FCSAA All-State second team honors. Awad will be a captain for the upcoming season and is now in the starting lineup. When on the court, Awad brings energy into the lineup. "I am a high motor player who can defend multiple positions and knock down the three. I have really improved my handle, my midrange game and finishing around the rim this offseason so I hope to see huge jumps in those areas this season." Utah State, Longwood, Nicholls State, Eastern Illinois and Arkansas-Monticello all recruited Awad. After some consideration, Winthrop came out on top. "Austin is one of the toughest players in the country, and is a flat out winner," said Shulman. "He absolutely loved Pat Kelsey and felt a connection with his fiery competitiveness and winning mentality. Austin loved Winthop's need for him, the school and city, the style of play, and the chance to win games. Austin can be a guy who elevates Winthrop to the Big Dance in his two years at Rock Hill." "I felt at home," said Awad. "Winthrop has a system that I really think I can thrive in. They have an incredible coaching staff and a great group of guys." The Eagles went 23-9 last season, going 13-5 in the Big South. Winthrop fans can expect great things from Awad once on campus. He looks forward to playing for the Eagle faithful at Winthrop Coliseum. "[Winthrop fans] are getting a high volume shooter who brings a lot of energy and toughness."